What’s Inside a Reverse Osmosis Tank? 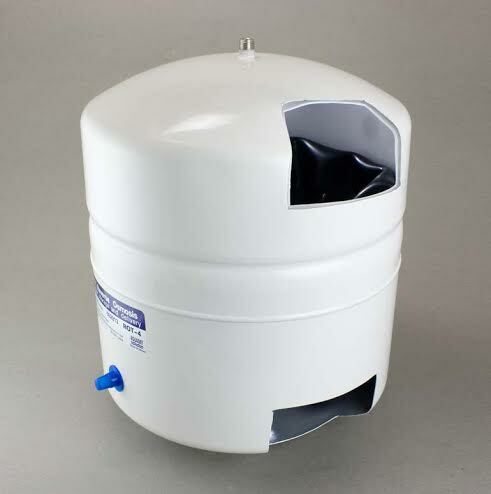 Among the most frequently asked questions about the small storage tanks used for home reverse osmosis units is what type metal they are made of. The answer is that it doesn’t matter from the point of view of water purity because the water does not touch the walls of the tank itself. In some tanks, especially older style tanks, the water is contained within a bottle made of an inert rubber material called butyl. The butyl bladder is surrounded by a pocket of air that pushes the water out of the tank. The only metal that the water touches is the threaded top stem of the tank where the water enters and exits the tank. In most modern tanks, the top stem is made of stainless steel. Many current metal tanks use a slightly different arrangement. Below is a cutaway of a top quality modern Aquasky RO tank. In the Aquasky tank the upper and lower halves of the tank are divided by a butyl partition, which can be seen through the window that has been cut from the tank. The upper portion of the tank contains a polypropylene liner that is visible in the picture. The water touches only the butyl partition on the bottom, the polypropylene liner, and the stainless tank neck. It does not touch the metal of the tank itself. Beneath the bladder is an air-filled compartment that provides pressure to push the water from the tank when the faucet is opened. The small blue cap at the bottom left of the picture covers the valve where air is added to the tank. And finally, what the world has been waiting for, a clear RO tank. 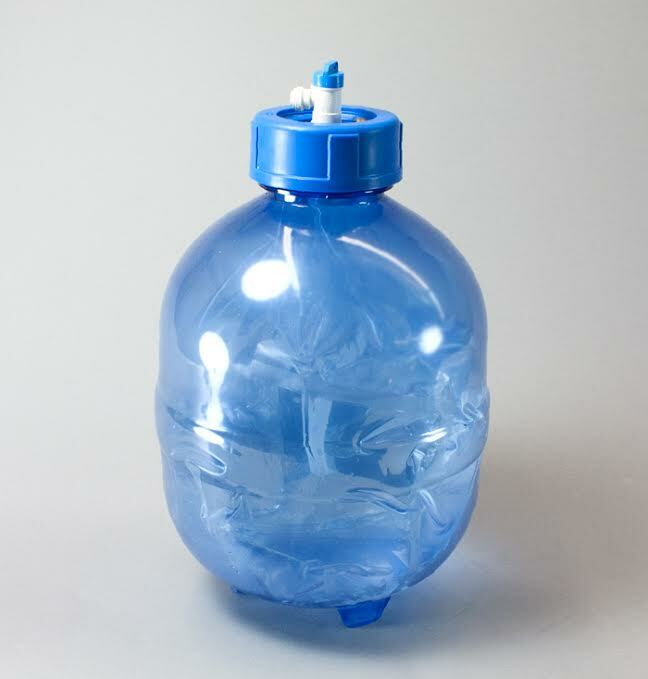 The tank above, which we received as a promotional sample from the Chinese manufacturer, is made of clear plastic and has a replaceable transparent plastic bag that holds the purified water. 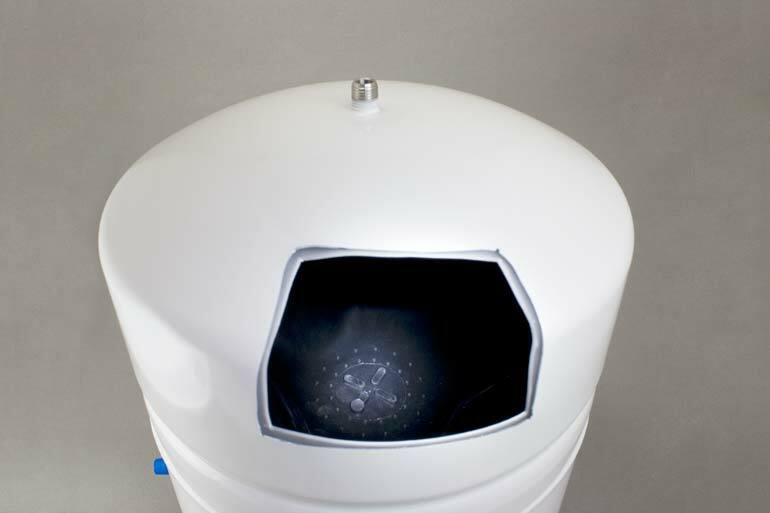 An air charge on the outside of the bag drives the water out of the tank.The picture shows the tank filled with water. Larger tanks, up to 80 gallons.